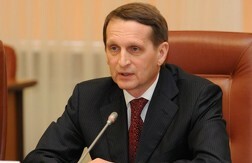 The State Duma speaker Sergei Naryshkin has spoken against introducing changes to the preamble of the Constitution of the Russian Federation stating that Orthodoxy is the basis of the national and cultural identity of Russia. “I would not support such a proposal,” Naryshkin told the TV channel “Russia 24”, explaining that this is due to the fact that Russia is a country of multi-ethnicity and multiple religions, RIA Novosti reports. Previously, the head of the Duma Committee on Family, Women and Children, Elena Mizulina, proposed amending the constitution in accordance with Orthodoxy. Her proposal was supported by the signatures of 300 thousand people. The speaker said that he finds the constitution to contain “very accurate legal and political phrasing” which does not require any changes.